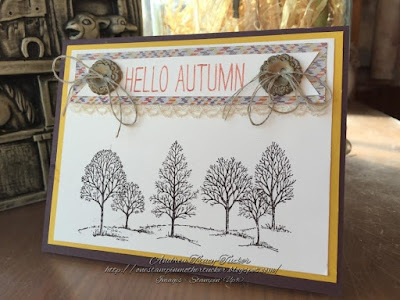 Welcome to our October OSAT Blog Hop! If you got here by way of Marisa Gunn I can't believe the amazing creations she did! She ALWAYS makes me say "Wow" and sometimes it is hard to do!! The lovely Tenia Nelson is also guest hopping with us this month! I am hoping she will want to say!! As you can see, I broke out my retired Sweater Weather DSP. Would you believe I somehow had an unopened pack? Now for the best thing ever!! I am going to be honest when I woke up Wednesday morning with NOTHING done for this hop, I was thinking Halloween... Thank heavens for emails from Splitcoast Stampers because they gave me my A-HA moment!! Phew!! All in a days work!!! I am so glad you stopped by! I can't wait for you to see our Guest Hoppers Tenia Nelson's goodies! She gave me a sneak peak! Andrea Tucker -- You Are Here!!! Labels: Fall Cards, Lovely As A Tree, Masculine Cards, One Stamp At A Time, Pumpkins, Stampin Up, Stampin' Up! I love fall! Your little pumpkin is so cute! Thank You so much Kim!!! We missed you this hop! Awwww, that pumpkin would look perfect on my office desk. I know I have some of that DSP (hoarded) away...time to use it up. Cute projects! Thank You so much Lori for stopping by! I too hoard DSP!! Oh my gosh, these are such sweet projects!!! The cork is genius (However, my favorite wine is a screw-top, what will I do????) That may be good otherwise I could have a serious collection of corks and my house would be filled with decoratvie paper pumpkins! :) But seriously--these are delightful projects and I really want to make the card--LOVE that you used a sharpie!! TOTES ADORBS is right! Dena! I am so glad to have you with us on the hop! So glad that you and I are becoming Unfiltered Stampin' friends!!! Thank you for stopping by! Thank goodness for SCS and Pinterest! I just love both of your projects, your colors and design are perfect!!! Well AJ Great minds think alike!! I think both came up with great pumpkins!! Thank You so much for stopping by! Cute card & project! I tried one of those pumpkins with no success. Yours is great!! Blah!!! I really don't "know" that I am amazing... I honestly surprise myself daily!! Thank You so much for you kind words! Lovely card and adorable pumpkin! 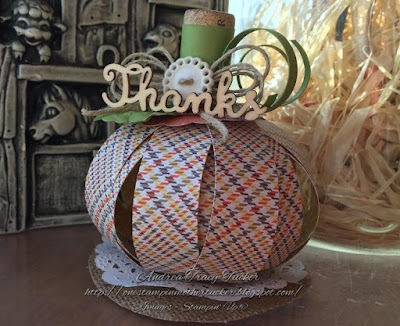 Love how you used the wine cork for the pumpkin top. I am taking wine cork donations LOL!!!! Thank you so much for stopping in and your kind words! Love your projects. 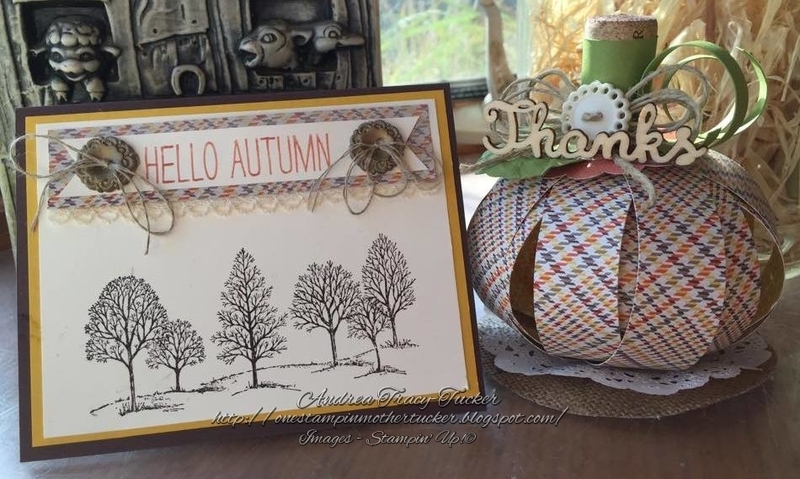 The simplicity of the card and the cute pumpkin that I would love to CASE! Of course your projects are adorbs!!! I am really happy that our paths have crossed. Our FT chats are always what I seem to need right at that time. You are blessing my friend! I am truly blessed by the friendships that Stampin' Up! has opened the doors to! You are a blessing as well! Thank You for your kind words! You Rocked this hop, lady!! Love your projects & card! Awesome job!! Oh that PUMPKIN though!!!! So so so cute! If I used all the corks from my wine bottles to make sweet little pumpkins like yours...I'd be at it for months. LOL. Love your projects.